This is an awfully poor example to try to make this point with. If you're going to leave cryptic comments, ikl, at least make them plausible. 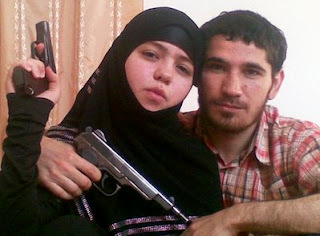 This is a girl from a small town in Dagestan who ran away from home to marry a Chechan militant (against the wishes of her family) who she met on the Internet (I'm guessing that they probably didn't meet on the Russian version of Facebook either). So it certainly doesn't seem like this is someone who was radicalized by her husband's death. The Dagestan part is important here - non-Chechans who decide to go to Chechnya to fight or married figher are likely to be in the grip of a pretty extremist Islamicist ideology. The "foreign fighters" are generally a pretty unpleasant lot. There are probably a lot of Chechan women who were radicalized by family members death. But this isn't one of them. The other thing here is that the only clear alternative at this point to killing Islamic militants is letting them take over the North Caucasuses. Chechan nationalists could, at least in theory, be molified by independence. It is not clear people fighting in Chechnya as part of larger struggle to establish an Islamic state in Chechnya, Dagestan, Ingushetia, etc. have political demands that can be satisfied (even if Russia just gave up resisting them, the locals in many of these areas surely wouldn't). Encouraging religious extremists (and their foreign financial backers) to infect the Chechan cause was one of the problems with Yeltsin's invasion of Chechnya back in the 1990s. But that die has already been cast . . . I'd still wonder whether she was motivated before his death to get to the maximal stage of militancy -- blowing yourself up in the most lethal way possible. Probably not (although who really knows - it is hard to predict will much accuracy who will become a suicide bomber). But I don't think that not killing Islamic militants who might leave behind lunitic Islamicist widows is really an operationalizable policy in this or most other contexts. Also, the Chechan separatist movement isn't exactly wildly popular in Dagestan (especially since militants during the brief period of de facto Chechan indepdendence). Ironically enough, a few hours after I wrote that last comment news broke that the second suicide bomber (a) was also from Dagestan, (b) was secretly married to an Islamic extremist, (c) who is not as far as anyone knows dead. So maybe the "probably not" should have been a "maybe not".